Searching For A Legal MP3 Or Song Download App? 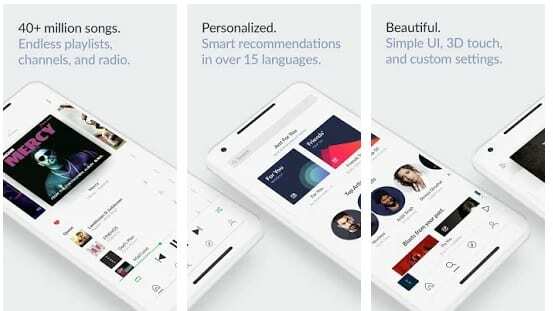 In this article, we will help you to find out the 10 Best Free Music Download Apps For Android where you can listen to music online and even download them on your device. Smartphones have completely changed the way we listen and organize our music. People rely on subscription-based services like Spotify and Apple music for enjoying music. Well, if vital music streaming services are not available in your region or you don’t want to pay for your music, then these free music download apps might help you. Soundcloud is an impressive music streaming service that offers an extensive collection of more than 150 million songs. Well, Soundcloud is the only platform where you can listen to remixes, beats, remakes and EDM’s created by upcoming music artists. Furthermore, a majority of indie creators offer permissions to download their tracks. Apart from music Soundcloud also has a decent collection of shows and finding your favorite podcast won’t be an issue. 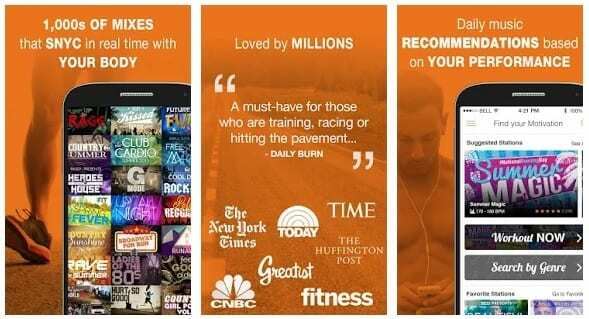 Moreover, the user interface of the application is very intuitive, and SoundCloud offers the best quality of music. YouTube has a vast collection of songs and music videos uploaded by popular music services like VEVO, T-Series, Sony Music and much more. Well, using TubeMate you can easily convert and download these YouTube videos. Tubemate allows users to convert YouTube videos to MP3 format and save them either on internal or external storage. Using TubeMate is self-explanatory, and the installation is similar to any other apk file. Tubemate allows users to download a maximum of up to 128kbps bit-rate music. This is decent for casual music listeners, but a majority of audio enthusiasts won’t prefer it. 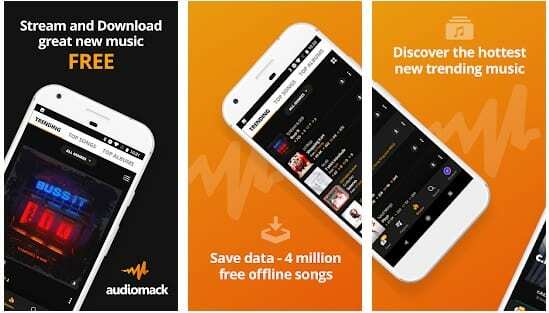 Audiomack is another best music downloader for Android smartphone users. This app offers a vast collection in different genres like Hip-Hop, Rap, R&B, EDM, Reggae music, and mixtapes. Users can easily stream or download music as per their preference. Audiomack also acts as a platform to help upcoming music creators to share their content. Lastly, Audiomack has a clutter-free UI. This application does exactly as the name suggests. Using the app is simple, and search filters like genres, artists or albums enhance the overall experience. Simple MP3 Downloader includes auto-completion features so that as you type, it suggests possible songs of interest. All of the songs downloaded can be located in the downloaded folder. Rock My Run is an impressive music listening application for fitness freaks that also doubles up as a best free music download app. Using the application users can download songs from vast public domains. Well, this workout app offers some of the most advanced features like Body Driven Music adjusts music tempo of mixes and playlists to match your steps or goal cadence. Rock My Run has a clean UI and decent music organization tools. You can select music from genres like Pop, Rock, Hip-hop/Rap, House, Dubstep, Drum & Bass, 80’s, 90’s, Oldies, Christian, R&B, Latin, Reggae, Seasonal, Country, Bmore, Classical. Lastly, the application also has dedicated Marathon playlists. Doesn’t work on low-speed internet connection. Next android music downloader on the list is SONGily. 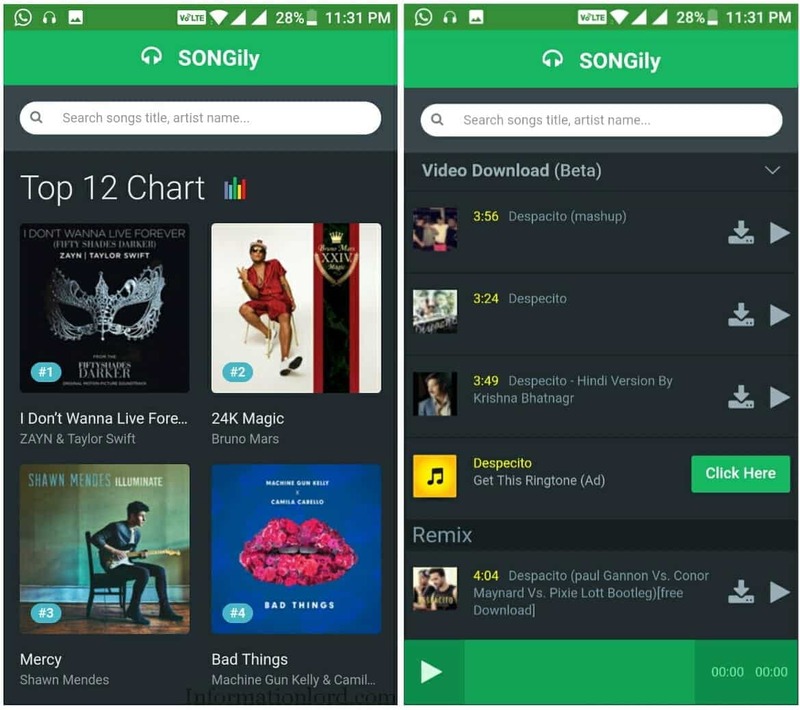 Using SONGily, you can either stream or download music. SONGily offers accurate search results and has impressive background playback and file transfer features. Furthermore, SONGily has a capable inbuilt music player and inbuilt download manager. Lastly, you can even use SONGily to download Youtube, Facebook, Instagram videos. Not ideal for downloading popular songs. Napster Music is one of the best free music download app for android users. 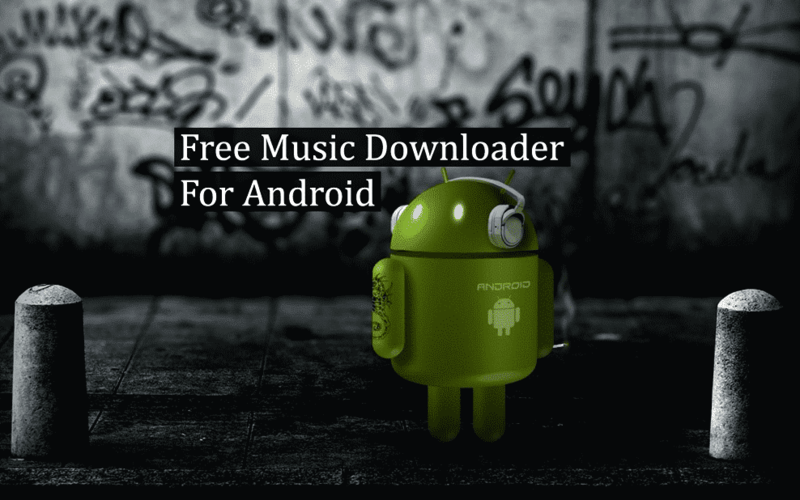 This free music download app for android offers an extensive collection of 40 million songs from 35 countries. Apart from songs, Napster Music can also be used for listening to FM radio. Lastly, this song download app also offers capable playlist management tools. 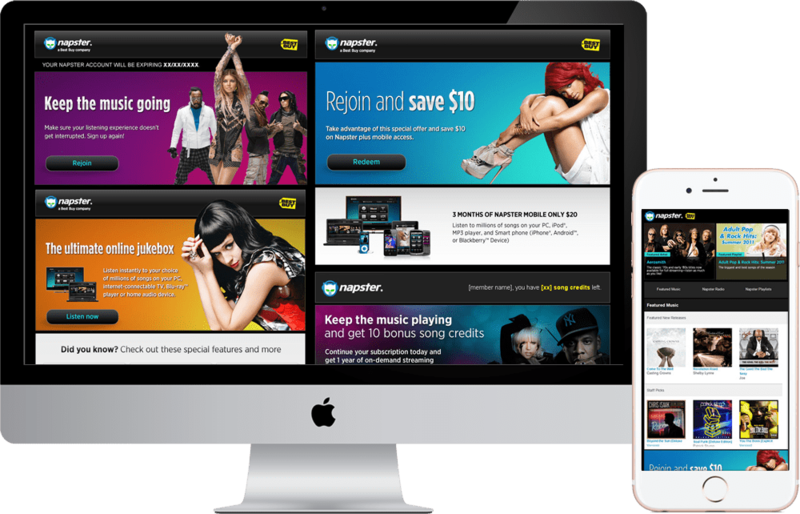 Napster Music comes with a free one month trial, you can continue using it if you like the application by paying a small amount. 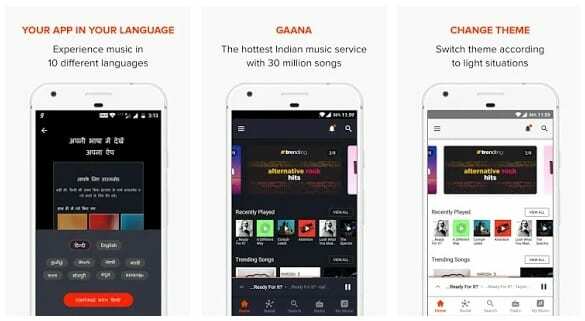 Ganna Music is a perfect application for streaming and downloading Indian Music. Apart from 30 million Bollywood & English songs collection Ganna Music also doubles up as a full-fledged FM Radio. Furthermore, Ganna also offers lyrics for every song on the streaming service. Upgrading to Ganna Music Plus, you can download unlimited songs for offline listening and sync downloads on five devices. 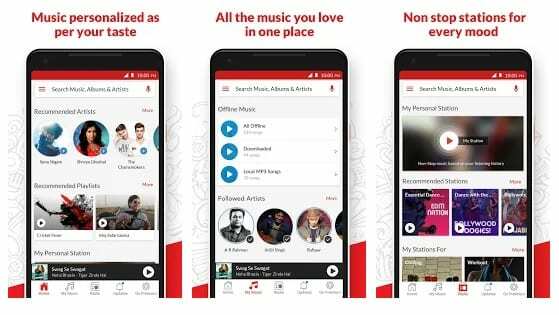 Wynk Music is another capable music streaming and downloading service. This streaming service offers thousands of curated playlists, and you can even follow artists and playlists. One of the major highlights of the Wynk Music is that it supports chromecast. Similar to Ganna Music you have to pay to download songs, but streaming songs is completely free of cost. Lastly, Wynk Music also has Internet-based Radio and capable exploration tools. Last application to download and stream music online for free is Saavn. Well, Saavn has possibly the best UI among all of the applications as mentioned earlier. While searching music on Saavn, you can even type lyrics that you remember to play a song. Similar to all applications you can create and save playlists of your favourite songs. Saavn has a decent organization for different moods or genre. So these were some of the best music downloading and streaming apps for android users. Well, if you made it so far do let us know which music streaming or downloading app do you use. Lastly, do share any other personal recommendation in the comments section below. I am using wonderfox free hd video converter factory to download my favorite music, it is a good app to have a try! This list awesome. Found some really good apps in it. It didn’t have Atomic Music Downloader though which I think is the best. Anyway, great post!